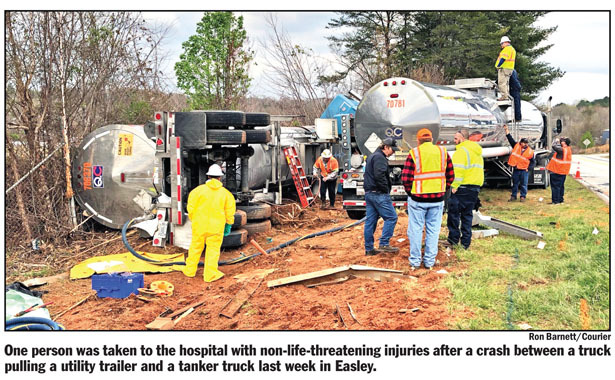 EASLEY — A tanker truck overturned after crashing into a truck pulling a utility trailer near the Greenville-Pickens Speedway last week, but no one was seriously hurt, according to the South Carolina Highway Patrol. The tanker truck was carrying liquid latex, none of which was spilled, according to Lance Cpl. Joe Hovis. A hazmat team was on the scene after the March 26 accident checking for any environmental damage. The tanker truck was traveling north toward Greenville on U.S. Highway 123 shortly before 9:30 a.m. and crossed the centerline as it turned left onto S.C. Highway 124, Hovis said. It collided with the other truck as it was heading to get onto U.S. 123 in the opposite direction, Hovis said. The driver of the truck pulling a trailer was taken to Greenville Memorial Hospital, the trooper said. His injuries were not life-threatening, he said. The driver of the tanker truck was unhurt. “He was actually pretty fortunate,” Hovis said. The tanker crashed through a section of guardrail and ended up on its side just yards from the raceway fence. Liquid latex is a common ingredient used in such products as face paint. The accident shut down parts of U.S. 123 for several hours as crews cleaned up the debris.